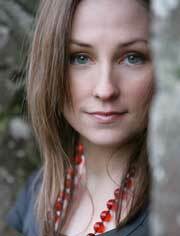 After three very successful studio albums, Julie Fowlis from the Hebridean isle North Uist has released a joyful energetic live album, recorded at Dougie Maclean’s Perthshire Amber Festival of 2010. If you know the studio albums you’ll know what to expect here, especially as the material derives from them. If not this is as good a place as any to sample the amazing talent of this Gaelic singer and whistle player, Scotland’s latest music pin-up girl. The fact that she sings almost exclusively in Gaelic hasn’t slowed down her widespread rise to fame, following her decision to move out of office work and into performing. Julie’s previous studio recording Uam was named Album Of The Year at the Scots Trad Music Awards 2010 and her Gaelic version of the Beatles’ Blackbird (Lon-dubh), which she performs here, got her into the charts. In a sense she follows in the footsteps of Catherine-Anne Macphee and Ishbel MacAskill by bringing the Gaelic art into ever wider circles. One is drawn in immediately with her gorgeous opening acapella night visiting song “Mo Bha Mi, Me Bha Mi” (Ho I Was, He I Was), before her first-rate accompanying musicians join in: husband Eamon Doorley on bouzouki, Duncan Chisholm (x-Wolfstone) on fiddle, Tony Byrne on guitar and Martin O’Neill on bodhran. Dougie Maclean makes a guest appearance to close the show with a gorgeous dual-language version of his song Pabay Mor. Sourcing music from Brittany to the Hebrides and beyond, Julie and her band are in sizzling form throughout, totally assured and revelling in each other’s lyricism. The action moves smoothly from sprightly dance medleys to plaintive ballads and lilting mouth music. Julie’s sweet voice rises over uncluttered arrangements where everyone has a chance to shine, giving the whole act a warmly intimate appeal. One can hardly believe she once suffered from stage fright. This is a real treat, nicely recorded as it came, with no after-treatments.